Looking to make the most of the new year? Thinking that your life needs an attitude adjustment but aren’t sure where to begin? 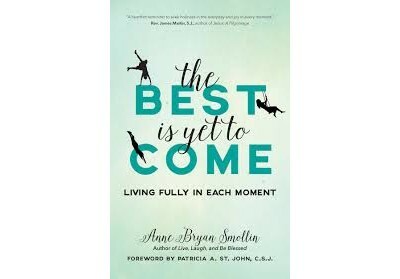 The Best is Yet to Come: Living Fully in Each Moment by Sr. Anne Bryan Smollin (Sorin Books, 2016) offers a wonderful guide to squeezing the maximum amount of joy out of each moment. Sr. Patricia A. St. John, C.S.J, who was Sr. Anne’s best friend and a fellow Sister of St. Joseph, shares in the Foreword that Sr. Anne lived by the mantra to “live well, love much, and laugh often.” She prayed that God would allow her to touch people’s lives. Sr. Patricia emphasizes that Sr. Anne lived the life she preached, “striving to seize each moment and live it fully, to experience the ordinary events of life as sacramental, and to cultivate possibility.” At the time of her sudden death in September of 2014, she left the manuscript of this book nearly completed. Sr. Patricia put the finishing touches on it for her friend, who was always convinced that the best was truly yet to come. In her introduction, Sr. Anne shares her hope that “as you read through these pages, you will be energized and challenged to make each day count .” As she points out, it is up to each of us “to decide how to live, how to spend those precious 86, 400 seconds” we each are given each day. Sr. Anne was an international lecturer on wellness and spirituality who also served as an educator and therapist. She had a doctorate in counseling psychology. Yet, despite all those qualifications, she retained the humility to laugh at herself. She is willing to share many embarrassing, humorous stories about herself as a means of making a point. She also shares many anecdotes she has heard. Like Jesus who spoke in parables, Sr. Anne knows that a story can preach louder than a treatise. There is no rocket science in these pages. No doubt, you’ve heard or read similar material at some other point in your life on the value of smiling, dreaming, making personal connections, the gift of proper perspective, a sense of humor, and being open to change. Yet, the message is of infinite value. No matter where we are on our life’s journey, we all can use the reminder and reinforcement because in the muck of everyday life, it is so easy to forget how meaningful and grace-filled it all is. In her final book, Sr. Anne has left behind a beautiful gift sure to touch many lives. May we, like her, trust that the best is yet to come as long as we are willing to look for, embrace, and appreciate it.